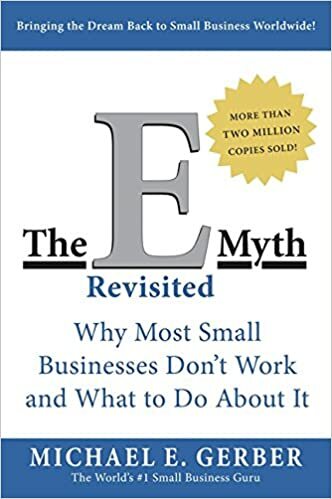 The E-Myth Revisited: Why Most Small Businesses Don’t Work and What to Do About It – loudlatinlaughing – Euge! Euge! I know, I know. Dull business books have no place on my read pile rubbing shoulders with amazing literature and non-fiction gems. But this book kept coming up in conversation after conversation I’ve been having with business owners and I finally held my nose for the plunge. It didn’t stink, filled with rather straightforward and readable talk about what it takes to build a business that doesn’t consume you but that you can replicate and eventually sell. The book garnered one of the highest star ratings that I’ve ever seen for a hugely reviewed book (1658 reviews on AMZN). The “e” in e-myth is for entrepreneur, not for “electronic”, thank god. I suppose having my own business also helped retain my interest, if you can call my consulting shop of one a business. The idea of managing folks gives me the cold sweats, so I’ve never really considered what it would take to build my business into, say, an agency. This book allows you to dream a little in that direction. What would I like to be doing 2 years/10 years/20 years from now? How much $$ will I need to do the things I want to do and by when? And I get it—putting things in writing makes you more able to commit to them. There are some wacky ideas and various suggestions that I disagree with, such as the tired idea that people respond to salespeople touching them. He includes a letter to the fictional woman that he’s helping with her pie shop and creepily ends it by saying “And remember, my heart will be with you wherever you are.” Then an epilogue, then an afterword. I’m sure Gerber would invent an after-afterword if he could. Verdict: possibly useful for anyone starting a non-consulting business.